When looking for homeware designs and accessories that really make the grade, there are many things to consider: durability, functionality and of course, their aesthetic appeal (after all, you want your home to look great, don’t you?). Academy Home Goods homewares do all of these things and more. Their range of homeware draw upon classic form and utilitarian function while also keeping up with trends and using a variety of materials. The Salinger Basket 2pce Set by Academy Home Goods is the perfect way to bring style and elegance into your home. 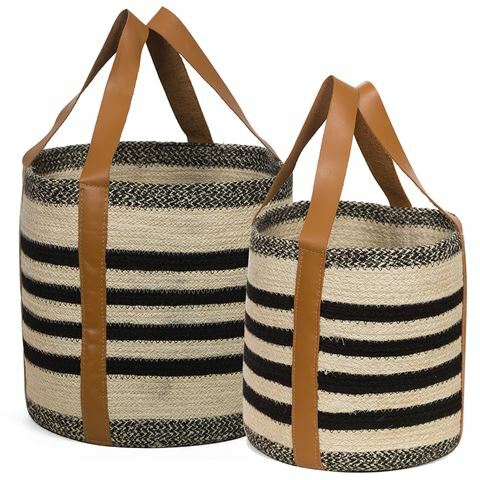 Crafted from jute, this salinger basket set fashions black and white stripes across its body, turning every head in its direction. Beautiful black and white stripe pattern. Great way to store personal items or decorate with plants. Each basket features two brown leather straps to make carrying easy. Small Basket Dimensions: 24cm (l) x 24.5cm (h) x 24cm (w) (Handles Not Included). Large Basket Dimensions: 32cm (l) x 29cm (h) x 30cm (w) (Handles Not Included).